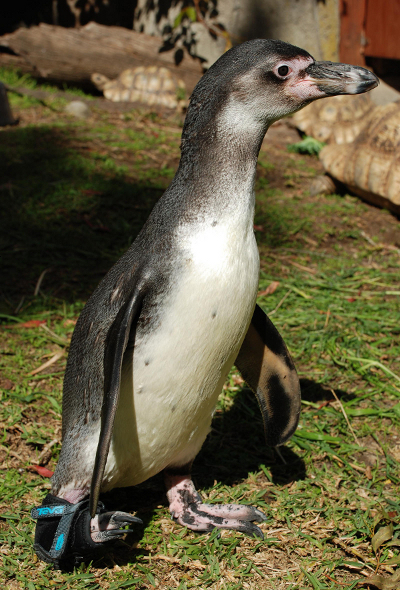 One of the youngest members of the Humboldt penguin flock at the Santa Barbara Zoo is now acting like the rest of his tuxedo-wearing buddies thanks to a high tech boot designed by Teva, an adventure footwear company who specializes in water wear for humans. The company, which is a sponsor of the zoo, saved Lucky’s life when zoo veterinarians realized the penguin’s foot was not developing normally and he was hobbling around and unable to get out of the water after swimming. "Teva is an expert at creating shoes for use in, on and around the water, which is just what our little penguin needed," said Zoo CEO Rich Block. "The penguin isn't the only one who is lucky – the zoo is fortunate to have such terrific community partners." The young chick was born in a nesting box on exhibit last April and seemed to be normal when zoo veterinarians first examined him. As he grew, though, it was obvious that his right foot was not developing normally and he was having troubling keeping up with the other penguins on land and in the water. Zoo officials feared that the sores he began forming at two months from his uneven gait would get infected and ultimately kill him so veterinarians began wrapping his foot in bandages. The idea for a shoe evolved from that. A Teva design team arrived at the zoo and measured Lucky’s foot and leg and made casts to design the shoe. A penguin, though, has specific needs that a human does not. The shoe had to be able to shed water, give traction and also be light enough so that Lucky wouldn’t be dragged downward when he swam. The Teva team was seriously challenged. “Our product team is experienced at collaborating with athletes but Lucky presented a unique challenge. We went through a bit more trial and error because of the language barrier, but Lucky knew what he was looking for in performance footwear, and he let us know when we had it right. In Lucky, we found a new friend and the perfect Teva athlete," said President Pete Worley. British author, Sarah Aspinall, intends to write a children’s book about Lucky which will be published this fall. All proceeds will go to the care and maintenance of Lucky. Teva has also agreed to provide boots for the penguin for the rest of his lifespan. The zoo will publically celebrate Lucky’s bipedal journey on Thursday, May 19, at 11 a.m.
Kathryn is a former journalist and English teacher who now counsels and mediates teenage drama on a daily basis in the Dallas, Ft. Worth metroplex. Time away from school is spent cooking up new macrobiotic/vegan specialties, writing various blogs and newsletters and taking as many bikram yoga classes as possible.